An easy and delicious recipe for Broccoli and Cheddar Twice-Baked Potatoes! You can try to resist the temptation of comfort food this time of year… or, you can be like me, and just lean on into it. I vote lean. These broccoli and cheddar twice-baked potatoes are just waiting for your embrace. Aside from making you drool, these babies are sure to satisfy any cheesy/carby/cozy food cravings. Each little potato boat is loaded with silky smooth mashed potatoes, broccoli (for our veggie fix! ), and tons of cheesy goodness. These are the best! 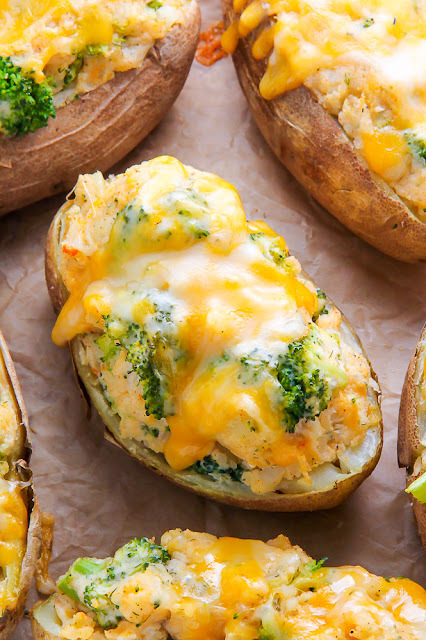 Broccoli and Cheddar Twice-Baked Potatoes are the epitome of comfort food! Add a salad to make them a full meal. Place potatoes in a small baking dish and bake for 1 hour, or until soft. Remove from oven and set aside to cool. Once the potatoes are cool enough to safely handle, slice each one in half, lengthwise. Scoop out the potato pulp and place it into a large bowl, being careful to leave the skins intact. Rub the outsides of the potato skins with a little olive oil. Place the skins on the prepared baking sheet and set aside. Add the butter to the potato pulp and mash - using an electric mixer or a potato masher - until fairly smooth; add Greek yogurt, buttermilk, salt, pepper, chives, garlic powder, onion powder, dried onion flakes, dill weed, paprika, broccoli and 3/4 cup of the cheese. Divide the filling evenly among the potato shells then top with remaining cheese. Bake for 20-25 minutes or until the cheese is melted and the potatoes are heated through. Serve at once!